Academic papers commonly employ strict terminology, special concepts, and clear theses. A physicist, for instance, must justify theoretically their conception of a given object; a philosopher must elaborate their conception in a coherent and accurate way; and so forth. However, besides abstract reasoning and logical inferences, there is another way of expressing ideas, a manner which is very popular in daily language. To use imagery in academic papers is not recommended; on the other hand, essays may contain various types of imagery since an essay is a special genre which allows for free expression of thought and feelings. In this sense, an appropriate place to employ imagery is your school essay or college level essay. It is also possible (and widely used) in journalism, as well as in some political speeches (every good politician should master the usage of imagery). There are several advantages and flaws which result from the use of imagery in your essay. Let’s define imagery as words, phrases and situations which resemble real physiological senses. Imagery can be defined as words, phrases and situations which resemble real physiological senses. Very often we explain a given phenomenon by referring to some physiological perceptions or feelings. For example, figurative language (figures of speech, like metaphor, allegory, etc.) describes a given object by comparing it to another object, without real connection between both. The usage of imagery in written communication has the same task: it has to communicate more information through images which are well-known to the receiver of the message. Unlike strict academic terms, imagery stands very near to the minds of the majority of people, thereby making the expression and manifestation of every conceivable idea possible. 1. The reader may lose the main idea of your essay (the solution is to define your concepts without using metaphors, symbols, images). 2. If you don’t know the meanings of some phrases, they may sound pretty funny, and even make the reader laugh at you. 3. The reader may conceive your essay as oversimplified due to lack of strict definitions and terms. 1. The use of imagery impresses your reader, particularly if you are experienced in that. They will remember the images, and not the concepts. 2. You explain better some concepts which are hard for understanding. This is the main point of the so-called popular science movies, or popular science shows (scientists like I. Asimov and C. Sagan were very good at that). 3. Your text seems more interesting and easy for reading. This fact implies the possibility of an increasing number of people to be attracted to it (you will have wider audience). In all cases, you should be very careful while using imagery in your essays. Always keep the balance between academic terms and definitions, and images and figures of speech. Read more; then you will know more phrases, and gain an “insight” on how and when to use imagery. Experience will make you a master of such way of writing. Remember: sometimes criticisms are useful so don’t hesitate to ask your readers for feedback. They should comprehend not only your main points, but also see that the imagery used by you is relevant to the topic and these points. 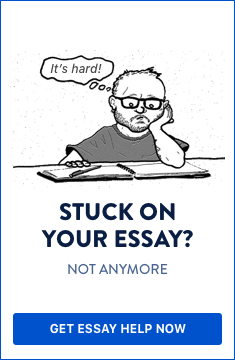 Your essay will be completed after you (and probably only you) have realized its flaws.